By Claire Freedman and Ben Cort. 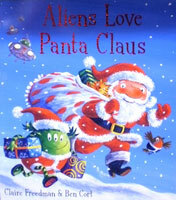 Everyone's favourite aliens are full of festive spirit. Join them as they help out in Santa's busy workshop, put neon pants on Rudolph and hang knickers up instead of stockings. Ho-ho-ho! Merry Christmas! 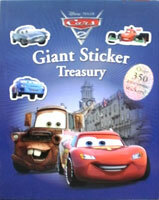 Disney Pixar Cars Giant Sticker Treasury with over 350 awesome stickers. This amazing collection of sticker activities will keep readers busy for hours on end. Match the pictures with Mater, complete the racing scene with Lightning, play games with Finn and lots more! Learn about opposites, numbers, colours and shapes. Use your stickers again and again. See you favourite Cars stars in full-colour glory! Bob The Builder, Little Miss Christmas or Winnie-The-Pooh. Each book contains Christmas puzzles, colouring, activities such as mazes, spot the difference, dot-to-dot, and over 70 stickers. 24 pages, soft cover. Ensure the kids have hours of quiet fun time this Christmas. Note: Little Miss Christmas book has a bend in one corner otherwise books are in perfect condition. Bob The Builder – Bob is in Bobblesberg, enjoying Christmas with all his friends! Suitable for 3-6 year olds. Little Miss Christmas – Little Miss Christmas is getting ready for the festive season. Suitable for 3-8 year olds. Winnie-the-Pooh – Winnie-the-Pooh and all his friends from the Hundred Acre Wood are getting ready for Christmas! Suitable for 3-8 year olds.